I’m always on the lookout for great writing guides—especially books on how to write narrative, slice-of-life essays (like mine). Only recently did I discover this book, Concise Advice, by Robert N. Cronk. What I loved was that his approach was different than mine, but arrived at the same goal—a compelling college application essay that reveals the writer’s unique personality, character, passions, talents, goals, etc. I was surprised at how similar this book was to mine, although it offered a different approach–and our goals were very similar. My guide steps students through the process of finding their defining qualities, and then looking for slice-of-life “moments” or “incidents” that illustrate that quality in a compelling way. I encourage them to look for “times” when they encountered some type of “problem,” and use that to show how they handled it and what they learned. The result are highly readable “narrative” essays that do a beautiful job of revealing what makes a student tick. Cronk’s approach has students use a movie script writing model, but it actually walks them through the same creative process. He encourages them to start with a “cold open,” where you begin with an exciting “moment” in a real-life story to grab the reader, and then go from there. He also encourages the reader to find some type of “conflict” that she or he can relate to show how they grew and changed. See how similar they are? I actually love that there are different ways to find and tell our stories in these essays. Me: So, Bob, the first thing I wanted to ask is how important you think the application essay is. Bob: It depends on the school, but for selective universities, I think it’s more important than ever before. With the advent of the Common Application and the use of the Internet for college research and rankings, schools are getting record numbers of applications. And because students self-select for the most elite schools, the colleges are inundated with so many applications that all portray great students. Everyone has great grades, wonderful EC’s, great recommendations, and so on. I participated once in the selection process for one department of a top school and I thought you could throw the apps into the air and grab randomly as they fell and still get a great set of students. So the essay is a chance for the school to start to really distinguish one student from another. Me: What are your most helpful tips for writing these essays? Bob: Writing an essay is unbelievably stressful for students. You stare at the prompts, you wonder how the school wants the prompts answered, and how to best put yourself in a good light. No wonder students get brain-freeze when they think about the writing process. And getting started is the hardest part of all. I think you and I agree that once an essay is started, the rest of the job is a little easier. So my top three tips (which will probably sound familiar to your readers) are: (1) Get started with an anecdote as you call it, or a “cold-open” as I call it; (2) Make your essay the telling of a story; and (3) Make the college want you. Me: Can you sum up your approach that you share in your book? Bob: You’ve always heard the phrase to “show” and not “tell” your story in an essay. But what is the most effective story-telling medium that shows the story and makes you fall in love with the main character? A movie, of course. So I teach the reader the basic “recipe” for movie scripts and how to adapt that to essays. My book gives specific ways to get started and to write in a focused way. For example, once the initial paragraph is written, I think the next step is to write the ending! This gives you a starting point and an ending point and helps keep the middle focused and the word count under control, essentially showing the transition from start to finish. Me: Does your approach help students’ essays stand out from the crowd? If so, how? Me: What do you say to students who don’t think they have anything “special” or “unique” to write about? Bob: For an essay to be memorable and powerful, the topic needs to be memorable and powerful to the writer. For something in your life to be memorable, it must be significant to you, special to you, unique to you. The topic for your essay has to found in your own memory. If that memory changed you, made you stronger, wiser, opened your eyes to something bigger than you, tested you, or impacted who you were, that is “significant,” and a good topic choice. My favorite essay of all time – by far – was from a student who met a great guy, and talked about their first few hours together. It was not only brilliantly written, but it showed a subtle change in her realizing that she was not alone in feeling somewhat isolated from her “conformist” friends. That essay is included in the third edition of my book. I am totally convinced that it led to her Ivy acceptances and a full-ride, non-needs-based scholarship to a prestigious California university. Thanks, Robert! Stay tuned for Part Two, and more advice on how to write stand-out college application essays! Ready to start your essay? 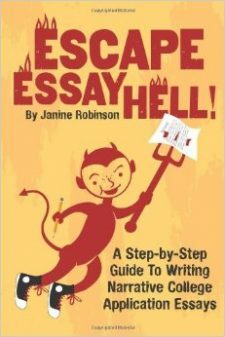 Check out How to Write a College App Essay in 3 Steps. Good luck! Leave me a comment if you have a minute. Love hearing from you all!! College Application Essay Grabber Trick: Show First! 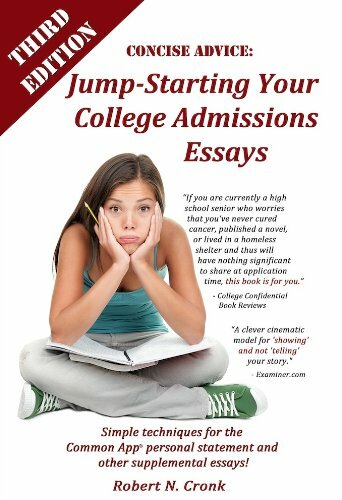 Aim High With Your College Application Essay! They Know When You’ve Been Naughty! Write Your Own Essays.